Summary THE HUNGER GAMES: MOCKINGJAY - PART 1 is the third film in the series adapted from the novels by Suzanne Collins. In this instalment, Katniss is chosen to lead a revolutionary force against the Capitol. 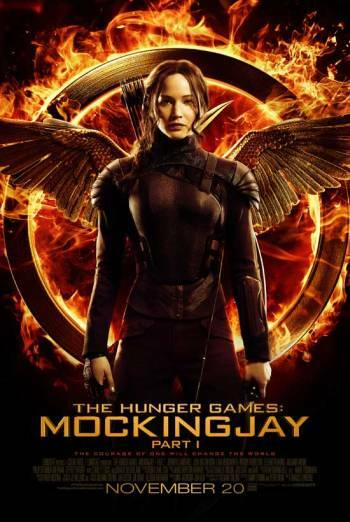 THE HUNGER GAMES: MOCKINGJAY - PART 1 is the third film in the series adapted from the novels by Suzanne Collins. In this instalment, Katniss is chosen to lead a revolutionary force against the Capitol. In one scene, a young woman is attacked by a young man, who hits her to the ground and places his hands around her neck. However, another man hits the attacker over the head and the woman's injuries are subsequently concealed by a neck brace. There are scenes in which groups of rebels clash with soldiers, which include people being knocked down and hit by bullets. However, there is very little in the way of blood or injury detail. Dead bodies are seen in a couple of sequences, with some charred skeletons in the ruins of a city, and bodies covered by sheets outside a hospital building. These images are only seen briefly and there is no close-up focus on injuries. There are several sequences in which the main characters are placed in danger, with some large-scale battle sequences as rebels face the government soldiers. Cities are attacked, with people forced to flee to safety, and some question about whether or not characters have survived. The film also contains references to death by hanging, with the main character singing a song about a 'hanging tree', and the song then sung by crowds of others as they start to follow her.